When it comes to PokÃ©mon, there are two types of people: People who've stuck with the series through all of the newer games, and people who haven't played a game since the original Red and Blue versions. The former have seen the series' gameplay tweaked to near-perfection since its original, less-than-balanced state (but have seen some truly odd new monster designs), whereas the latter dig their heels in and steadfastly refuse to recognize that any PokÃ©mon exist beyond the original 151 (or, in some cases, the 251 introduced in the second generation). PokÃ©mon HeartGold and SoulSilver - remakes of the second-generation Gold & Silver - are games designed to bring these two people together. As far as this goal is concerned, they're a remarkable success. It feels odd to really review a PokÃ©mon game these days, because the core of the series remains essentially unchanged from the days of Red & Blue. As a child in a world filled with a wondrous collection of bizarre beasties, you're given a new best friend from a PokÃ©mon professor and sent out in the world to have an adventure and to try and catch 'em all. You'll need to use your monsters to catch others and build up your team, you'll enter eight elemental-themed Gyms, earn badges by defeating their leaders, and finally make your way to challenge the most powerful trainers in all of the land. If that sounds familiar to you, it should. The basic gameplay of PokÃ©mon is the same as it's always been. Essentially, they're turn-based RPGs with an absolutely mammoth potential roster of characters, where the effectiveness of one's attacks is based as much on stats and levels as it is a giant game of rock-paper-scissors-gun-baseball-bat. Every PokÃ©mon has its own elemental "type," every attack has a type of its own, and some are better than others. Using a Fire attack against a Grass type will do double damage, but the same attack against a Water type will find its power halved - and that's the most simple exchange in the series. Being prepared for any given battle (especially against the Gym trainers, who are all specialized in a single type) is just as important as what you do in the battle itself. The gameplay itself is based on the excellent fourth-generation systems introduced in Diamond & Pearl, and people who haven't played the series since the first generation will find a lot of tweaks that may not seem too substantial but result in a subtly, but significantly different experience from what they may be used to. 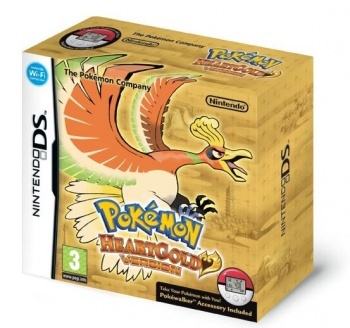 PokÃ©mon abilities, double battles, weather effects - the list goes on, but suffice it to say that the gameplay in HeartGold & SoulSilver is the furthest-evolved we've seen of the series yet. It's true that not much has changed between Diamond & Pearl and these games, but not much really needed to. The changes are small - for example, you can now have one PokÃ©mon companion of your choice walking behind you at all times instead of just carrying them all around enclosed in their PokÃ©ball containers. It's a small touch, but one that helps you feel more connected to your team.